When SC Justice Ruth Bader Ginsburg had her recent fall, I was sad to notice a small number of conservatives offending all the other conservatives by expressing negative wishes about Justice Ginsburg’s health. Big fail! We don’t want our political ‘enemies’ to pass away, but to repent and reform. Or at least to cease doing things that cause harm. Remember the ‘Love your enemies’ thing from Matthew 5:44? 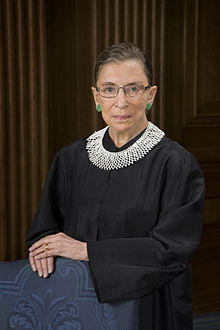 Ruth Bader Ginsburg is no spring chicken, and when I see a picture of her, she looks very fragile. We want her to be in good health, but as she is mortal and imperfect, we want something better than just physical health for her. She needs spiritual health. Because we want everyone, even our political or other enemies, even people we don’t much admire, to have a shot at heaven rather than be stuck with the alternative. Every person also needs spiritual wisdom to know what is right and therefore pleasing to God, and what is wrong and therefore displeasing to God. And just knowing that God exists and has certain attributes is beyond the knowledge of many people. And just having spiritual wisdom is not enough if you don’t do anything about it. In the Catholic Church we often talk about the blessed dead as having ‘died in friendship with God.’ That’s not a religious or denominational label. A Christian teaching is that God writes His law in our hearts— which would mean that every single person has some hint of God’s truth— and is free to embrace that truth or turn away from it. We want Ruth Bader Ginsburg to embrace the Divine wisdom she has access to; to live in friendship with God so she can die that way. As a Supreme Court Justice she has had the power to make decisions which affect the lives and deaths of many people. May God prevent that she make any decisions that prove harmful to others. Real conservatives don’t want bad things to happen to people like Ruth Bader Ginsburg, but we don’t want her helping to make any harmful decisions that would expand ‘abortion rights’ or take away religious freedoms. Not just because we would disagree with such decisions. We also don’t want such decisions on Justice Ginsburg’s soul or any other Justice’s soul.